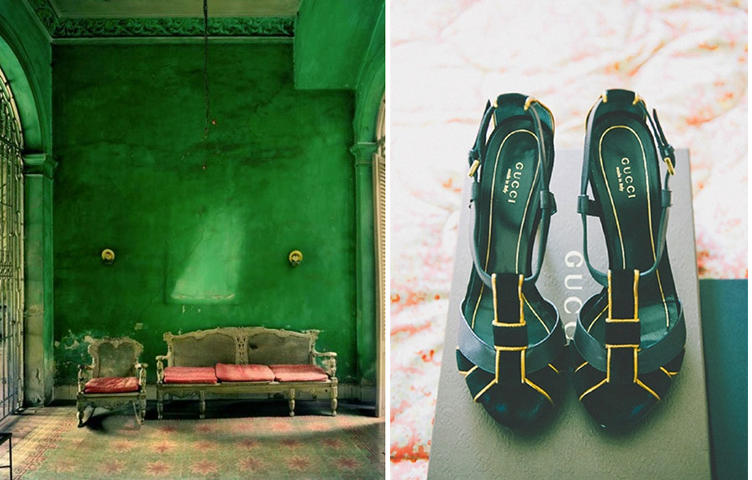 Styled BUY Divya: Green with envy. Catch it while you can. I am working on redoing my boudoir.... and I love the emerald wall. Hunting these shoes down may be a task, which I am up for. In the meanwhile easier is, to order all.... okay, at least a few of these and have them in time for this weekend's party line up... if the winter chill holds up, I will be wearing this wonderfully dramatic feather gilet with the shorts! 1. Feather gilet 95 GBP. 2. Sequin shorts 32 GBP. 3. Back open top 36 GBP. 4. Linked emerald neck chain 20 GBP. 5. Yellow and black heels 232 USD. As for me, I am a fashion designer on a creative leave. My brand is called Tambourine, which is found in chic boutiques in Ibiza, the south of France and even online in NYC. I am from Bombay having lived in New York and London. My fashionista friends on various continents have always admired my knack for mixing Zara and Givenchy, Top shop and YSL. Thanks to their ideas and years of inexpensive chic fashion victories, I decided to launch this site on my creative leave from designing, to keep my senses tingling!